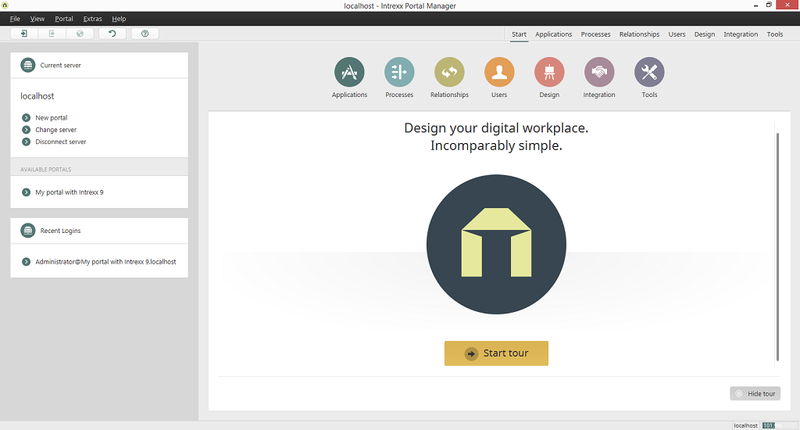 On the start page of the Portal Manager, you have the option of viewing a brief introduction of each Intrexx module by clicking on "Start tour". Click on this button (at the bottom right) to hide the tour. You'll see the main menu at the very top - highlighted in red here. Further information about main menu functions can be found here. You'll see the symbol bar beneath the main menu. The most important functions can be accessed from here. The functions of the symbol bar can also be accessed from the main menu. If you move the mouse over a button in the symbol bar, a quicktip will appear with information about the button's function. You switch between the various Intrexx modules here. 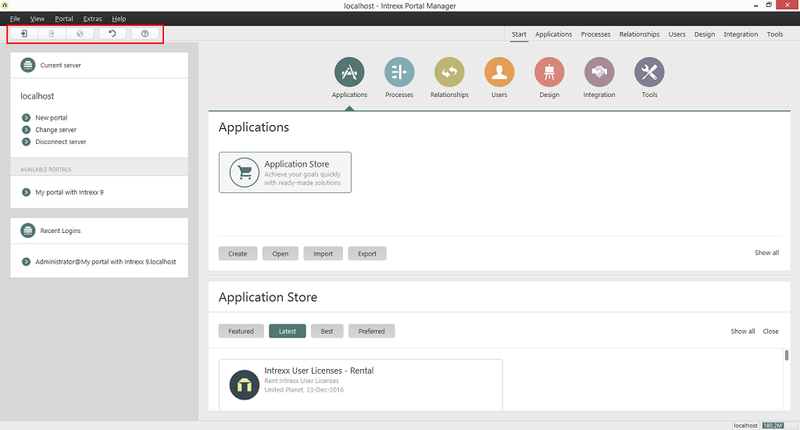 Click on Applications, for example, if you want to create or edit an application. Depending on the window size of the Portal manager, the part of the symbol bar that displays the names of the modules will be minimized and moved to the right. Opens a submenu from which the various modules - currently hidden - can be selected and openend. 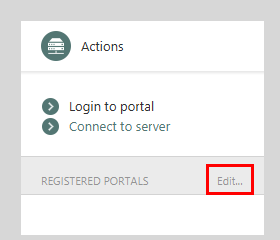 If you open a module and you're not already logged in to a portal, the dialog for signing in will be displayed. Select your desired portal and enter your login details. After logging in, the corresponding module will open. Opens a dialog where you can enter details of the portal you would like to connect to. Opens a dialog where you can select a portal server to connect to. The name of the server that the Portal Manager is currently connected to is shown here. Opens a dialog where a new portal can be created. Opens a dialog where a different Intrexx portal server can be selected and connected to. Disconnects from the current server. Afterwards, the link text will change to "Connect to server". 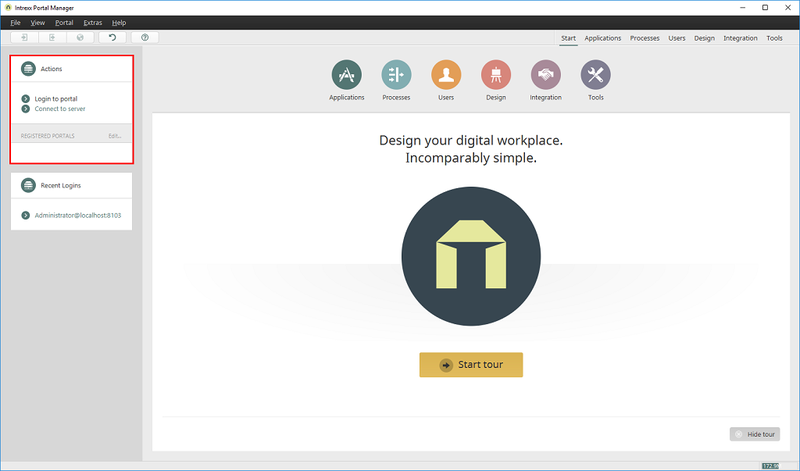 Opens a dialog where an Intrexx portal server can be selected and connected to. The name of every portal created on the server you are currently connected to is shown here as a link. Clicking on a link opens a dialog where you can log in. If you are already logged in to a portal and you click on a different portal link, the Portal Manager will ask you if you want to log in to the other portal. You can log in to a brand new portal with the username Administrator and without a password. If you are currently not connected to a server, the "Edit..." link will appear here. Click on this link to open a dialog where the desired portals with the server, where they are available, can be registered. The registered portals will then be listed in the "Available portals" area when you are not connected to a server. When you then click on one of these links, a connection to the specified server will be established and the corresponding server will be opened. The users who have most recently logged in to portals will be listed in the format <User name>@<Portal name>.<Server name>. Opens a dialog where the portal properties can be edited. Logs you out of the current portal. By clicking on the module symbols you can reach the most important functions for each module quickly. 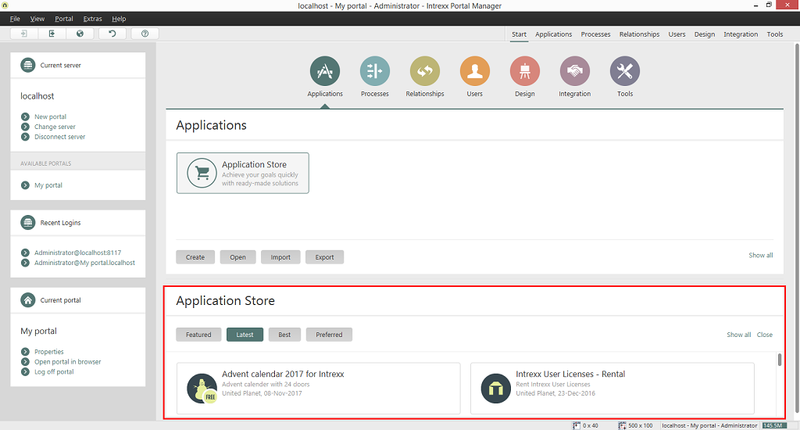 This area provides you with access to what is currently available in the Intrexx Application Store. The list of applications provided to you in the Application Store can be filtered by various criteria. To do so, click on the corresponding button to, for example, see an overview of the newest applications.